Visual memory is a key skill for STEM. Mathematicians, scientists and artists all rely heavily on visual memory to be efficient in their work. Visual memory is the ability to remember what you see, including images, patterns, colors or what’s in “the mind’s eye”. Why is Visual Memory important? While you can definitely succeed in school without strong visual memory, your visual memory helps a lot. For elementary students, visual memory is key to memorizing math facts and sight words. As students progress in school, visual memory becomes increasingly important in subjects like geometry, algebra, and science, where you need to remember patterns, shapes and diagrams of multi-step processes. While it’s true that technology is a good enabler so that students don’t need to memorize nearly as much as they did in the past, math facts efficiency is still key to long-term math success. Accurately and efficiently recalling what you’ve seen before is the first step in making connections and learning. Is my student struggling with Visual Memory? Signs of a student struggling include difficulty with math facts or sight words. Do they have difficulty recognizing a place they’ve been or a picture or person they’ve seen before? Students who might readily understand new concepts but often say “I forget” might be struggling with visual memory. 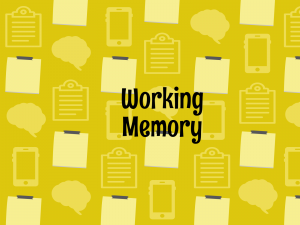 How do I know if my student needs help with Visual Memory? If you suspect your child is struggling with visual memory you could discuss your concerns with your teacher. Since visual memory does not play as key a role in school as skills like verbal reasoning or working memory, teachers might not readily observe visual memory gaps. However, you can use an objective visual memory test and then make a decision if you need to speak with a professional. There are strategies to help a student with weaker visual memory, especially if their verbal memory is stronger. Dual-coding or pairing pictures with their own descriptions or captions will help. Spacing out studying (rather than cramming) is important for students with weaker memory. Also rely on their stronger skills. If your cognitive screener indicates that their reasoning skills are stronger, teach them how to make connections (elaboration) rather than relying on rote memorization. Every student is different, and the strategies will depend on their unique combination of strengths and needs. 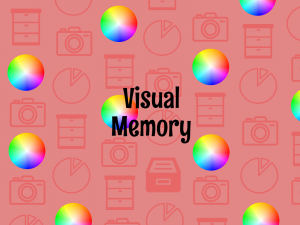 Check out our visual memory test!